Solarstorm is like being trapped in a close orbit of the sun and feeling the violent explosion in the sun's atmosphere. 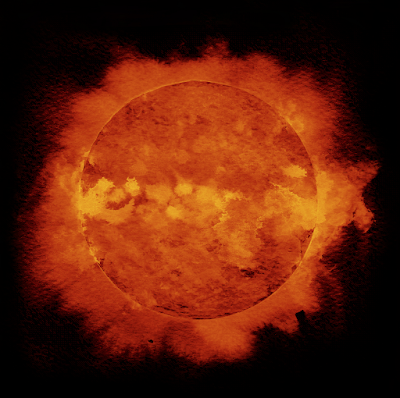 Solar flares take place in the solar corona and chromosphere, heating plasma to tens of millions of kelvins and accelerating electrons, protons and heavier ions to near the speed of light. Most flares occur in active regions around sunspots, where intense magnetic fields emerge from the sun's surface into the corona. Flares are powered by the sudden release of magnetic energy stored in the corona. The release also contains twelve colored ink drawings to wrap the whole release and build a visual concept for this audio release. The drawings were made by Sorin Paun himself. All tracks produced and arranged by Sorin Paun. 2008. "Overall I wanted to give this one five stars because it really is a superb concept and is beautifully executed. The artwork in particular is stunning, and the inclusion of a dozen hand-drawn artworks representing the concept of the album is a very sweet touch. The only thing that keeps me from giving it a full 5 stars is the mastering. I'm sure that overdriving the pulsations so far was for dramatic effect, to give the impression of the sheer power of the sun, but it didn't do my sound system or my speakers any favors. Back the gain off about 5 dB and you have a damn near perfect release. As it stands, it is merely excellent. :-) Nice work." SolarStorm by SunMoon is licensed under a Creative Commons Reconocimiento-NoComercial-CompartirIgual 3.0 Unported License.